Slow Cooker Jalapeno Popper Chicken Taquitos start with chicken that’s cooked in the slow cooker with jalapenos and other spicy seasonings and then made into delicious taquitos! I think this sounds like a wonderful idea for Taco Tuesday tomorrow! Click Here to see The BEST Slow Cooker Mexican Food Recipes! Click here to see The BEST Instant Pot Mexican Food Recipes! You can never have too many slow cooker recipes that start with boneless, skinless chicken breasts, right? 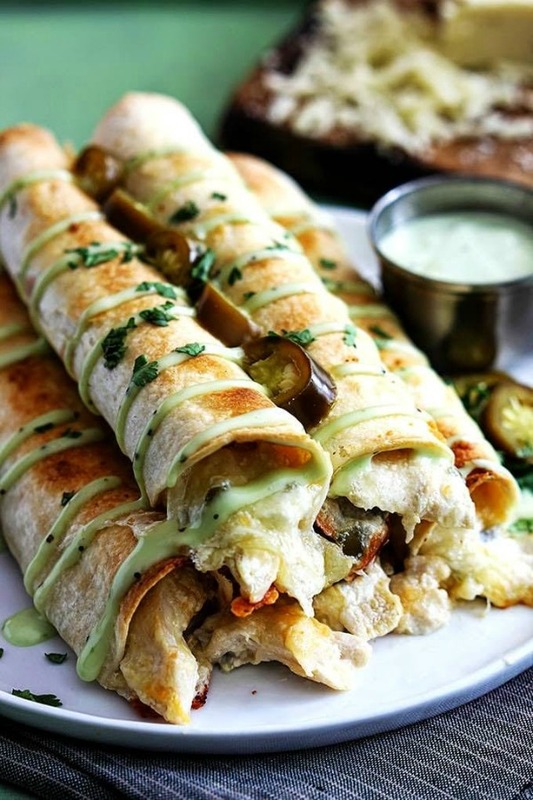 And that’s especially true when the chicken is cooked with spicy flavorings and cream cheese and then shredded apart and made into something delicious like these Slow Cooker Jalapeno Popper Chicken Taquitos from Creme de la Crumb. Tiffany says you can even start this recipe with frozen chicken breasts, and the Jalapenos come from a jar, which would make this ultra-easy to get into the slow cooker in the morning. And if you’re cooking for people who don’t like much spicy heat, you can adjust the amount of Jalapenos to taste in these slow cooker chicken taquitos. Once the chicken is cooked, transforming it into these delicious-looking Slow Cooker Jalapeno Popper Chicken Taquitos sounds easy. I think Slow Cooker Jalapeno Popper Chicken Taquitos sound perfect for a Taco Tuesday chicken dinner from the slow cooker; what do you think? Get the complete recipe for Slow Cooker Jalapeno Popper Chicken Taquitos from Creme de la Crumb. Love the sound of this chicken filling. I've never made something with cream cheese in the slow cooker. It sounds delicious. Lydia, my sister has a favorite recipe with chicken, cream cheese, and Italian dressing mix that she's made for years so I can see how this will work too. And I haven't used cream cheese much in the slow cooker either; need to try it! Thanks for pointing this recipe out to us all, Kalyn!